Villa Salina is part of a six-villa development, majestically claiming its own in a three-storey structure overlooking the remarkable Indian Ocean on the shores of Sri Lanka. The beautiful property is marked by lush tropical foliage, towering palm trees, and a stunning infinity-edge swimming pool. Perfect for families and friends traveling in large groups, the villa offers quality services to its guests to ensure that your stay is memorable and worth every dollar spent! Villa Salina is essentially a home away from home with contemporary interiors and comforts. The villa offers several facilities to its guests, and the best part about it are its six bedrooms spread across the three floors of the villa. The master bedroom is located on the second floor and is furnished with a king-sized bed and is air-conditioned. It has an en-suite bathroom with both indoor and outdoor facilities. The private terrace offers a stunning view of the ocean. The five bedrooms at Villa Salina are located on the second and ground floor. While three of the bedrooms are furnished with king-sized beds, the last two feature twin beds, more suited towards children. Each bedroom has an en-suite bathroom, beautiful views, and are air-conditioned! A mesmerizing vista awaits at Villa Salina’s well-maintained swimming pool and yard which directly faces the ocean glistening in the distance beyond the palm trees. 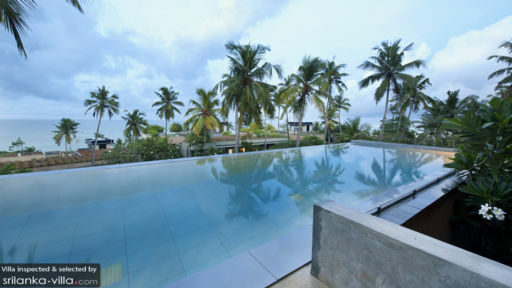 The lavish swimming pool sits snugly waiting for you to dive into its cool, comforting waters and gaze out at the ocean endlessly taking your time to appreciate nature’s bounty in beautiful Sri Lanka. The pool features a stone pathway on its surface where you can sit or enjoy a few drinks in the glow of the tropical sun. The pool deck is shaded under a roof and is furnished with several sun chairs, perfect for lounging and napping after a swim! The luxurious living spaces at Villa Salina are worthy of notice as they have been designed to extend absolute warmth, comfort, and hospitality to the guests of the villa. 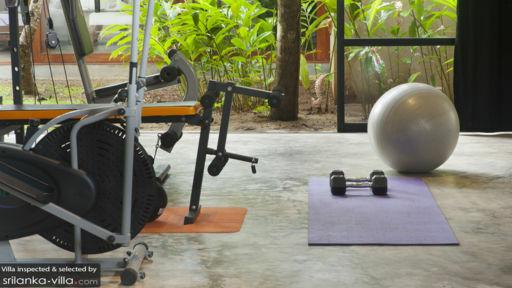 The air-conditioned room is directly behind the swimming pool thus, offering easy access to the outdoors. It is furnished with numerous couches, sofas, armchairs, and ottomans where you can sit with your friends and family and enjoy some peaceful and substantial time in the serene environment. The dining area and kitchen are equally spacious and well-furnished for the best experience. The dining table is appropriate for the guests of the villa, and it is here that you will truly enjoy staying at Villa Salina, as you get to indulge in heartily prepared delicacies and specialties of the chef. The kitchen is fully-equipped with modern amenities and has been designed with an open-western concept for more movement around it. With a massive island top in the middle, guests can easily prepare their own meals as well, for an afternoon party or a BBQ with their loved ones. 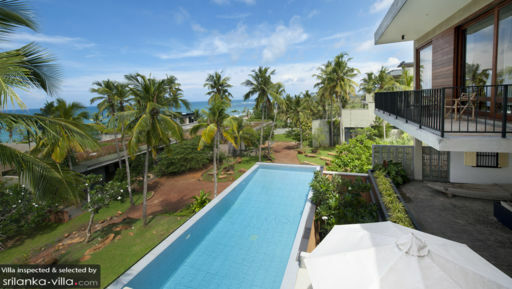 Poolside dining, rooftop bar, and a games room as well as media room are only few of the services offered by the villa! The villa manager will ensure that you have everything you need during your stay at Villa Salina. The chef will delight your senses with a culinary treat day in, day out! And the house staff will look after the cleaning and maintenance of the villa’s interiors and the pool. The villa offers beach access to guests, so you can engage in fun watersports and other activities in the midst of sun, sand, and the sparkling ocean! The beautiful and scenic fishing town of Mirissa is only minutes away from the property. A quintessential party spot, Mirissa is known for its beach and the night-life. If it’s a true Sri Lankan experience you are looking for, then this is the spot for you! Can't say enough good things about our time at Villa Salina, from the very first moment we arrived until we were left we were looked after by the Villa staff! They were amazing and able to help with any request, even going above and beyond when one of us had a hospital visit, coming and managing everything without a worry! The Villa itself is absolutely massive, the bedrooms are generous and include beautiful furniture. The location is close to Mirissa and only a Tok Tok ride to great restaurants like Lantan. The staff were always on point with their recommendations. Again, can't recommend enough!!!! !